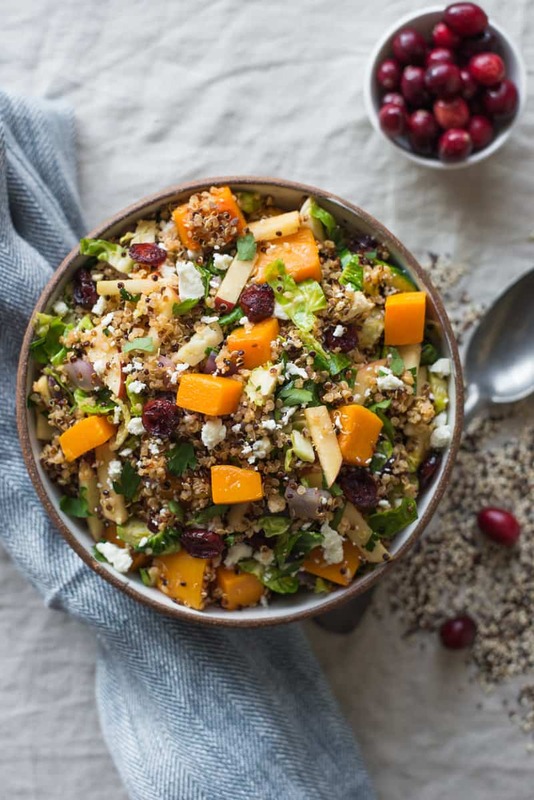 This colorful and healthy fall harvest quinoa salad is packed with butternut squash, brussels sprouts, apples and cranberries. Perfect for parties! I don’t know about you, but I am looking forward to celebrating Thanksgiving this year with my friends and family more than ever. Over the past few weeks, I’ve found myself lapsing into long periods of self reflection, and I’ve been thinking a lot about being a food blogger. Some of you may know that I come from a very humble background. Before immigrating to America, my family lived in a small village in China. They weren’t exactly dirt poor, but even something like sugar, which to us seems so commonplace, was a luxury. Can you imagine that? And here I am, making a living from something that didn’t come easily for them. I am so dang grateful to be in this position, and I can’t wait to show my thanks to my family next week. Now, I am that crazy person who craves a healthy salad during my Thanksgiving meal. Between the turkey, the mashed potatoes, my sister’s artichoke dip and Mama Lin’s fried dumplings and sticky rice, Thanksgiving dinner can become a heavy ordeal quickly. Midway through the meal, I’m desperate for the taste of greens and other bright vegetables. 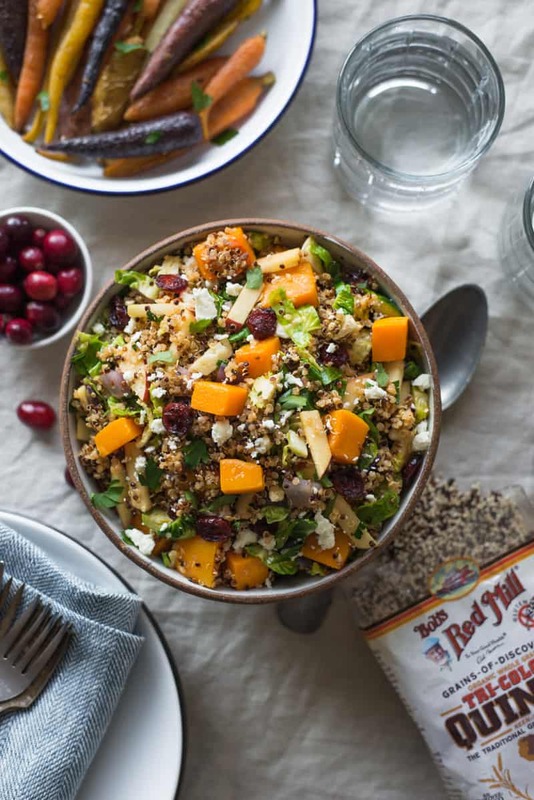 Today, I’m excited to partner with Bob’s Red Mill today to bring you a simple quinoa salad filled with my favorite fall fruits and vegetables. I particularly love their organic tri-color quinoa because it gives an extra pop of color to my dishes. If you know any brussels sprouts skeptics, this salad is a great dish to get them to warm up to the vegetable. The brussels sprouts are thinly sliced, so their flavor won’t be so intense so as to put people off. 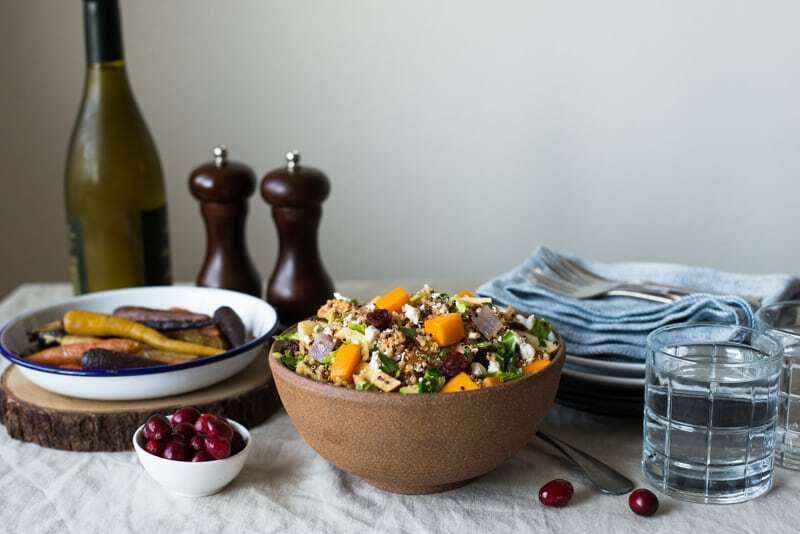 This fall harvest salad is truly a celebration of all the sweet and savory flavors of fall. Hope you enjoy it! Flavoring the salad: I added light flavors to this quinoa salad because I wanted to be able to taste the fruits and vegetables. During one of my test batches, I added cumin into the mix, which ended up overpowering EVERYTHING. My suggestion: feel free to add whatever herbs and spices you want to the salad, but keep a fairly light hand. Preparing the butternut squash: Try to chop the butternut squash into small-ish pieces (about 1/4 to 1/2-inch chunks). They will cook a lot faster that way. Plus, nobody wants a massive chunk of butternut squash in their salad. Also, I used to make the mistake of over-salting my butternut squash. The tiniest pinch of salt will make a big difference, so don’t make the same mistake I did! Sautéing the brussels sprouts: I found that when I sautéed the brussels sprouts a little longer, its flavors became more intense. Depending on how you like your sprouts, this could be a good or bad thing. Just make note of it! If you try this recipe, let me know how it goes by leaving a comment or sending me a message! Or take a photo of the food and tag me on Instagram so that I can give you a fist bump! Seeing your creations makes my day! Add quinoa and water into a saucepan and bring to boil. Reduce heat to a simmer and continue cooking the quinoa until all the water has nearly evaporated. Turn off the heat and cover the saucepan with a lid. Let quinoa sit for 15 to 20 minutes so the quinoa can fluff up. Preheat oven to 375ºF (190ºC). Line a large baking sheet with parchment paper. Set aside. Chop off both ends of the butternut squash. Peel outer skin. Split butternut squash in half by cutting it right down the middle. Remove seeds and chop squash into 1/4 to 1/2-inch chunks. Toss squash with 1 1/2 tablespoons of olive oil and a tiny pinch of salt, about 1/4 teaspoon. Spread onto baking sheet and bake for 25 to 27 minutes, until the squash is fork tender. Remove from oven. Trim the bottoms of the brussels sprouts. Chop them in half, and then slice them into 1/4-inch strips. Heat another 1 1/2 tablespoons of olive oil in a large pan. Add onions and sauté them for a minute or two, until they start to soften. Add brussels sprouts and cook for 3 to 4 minutes. Season with a small pinch of salt and set aside. Add quinoa to a large bowl. Add 2 tablespoons of olive oil, 3 tablespoons of lemon juice, paprika and salt to taste. Slice apple into thin strips and toss with a tablespoon of lemon juice. This helps keep the apple from browning. 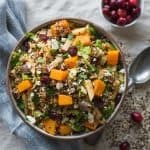 Add butternut squash, onions, brussels sprouts, apple, feta, dried cranberries and parsley to the quinoa and stir everything. Adjust seasonings to your liking. If you want more tangy flavors in the salad, you can add a few tablespoons of vinegar or more lemon juice. Serve immediately. *If you are using pre-cut butternut squash, you’ll want about 755g or 5 cups of squash. Disclosure: This post was sponsored by Bob’s Red Mill. Find out more about Bob’s Red Mill’s products and recipes on Facebook, Instagram or Pinterest! What a beautiful salad, Lisa! Love everything happening in it. Love love LOVE all the beautiful colors in this salad <3 Bob's is the best! I loved what you said on Facebook and yes, I too am super thankful to be able to do what I love. . we all have a lot to be thankful for this season. this fall harvest quinoa salad looks amazing!!!! So delicious!! Thank you, Alice! Hope you have a wonderful Thanksgiving! Sweet and savory salad perfection Lisa! Such gorgeous fall colors too! Sweet! I love that TJ sells the full stalks! Such a great reminder to slow down and be thankful. It’s disturbingly easy to forget that even during a holiday centered around that concept! Love what you’ve done in this fall salad, I’d happily enjoy this little bit of health among all the other indulgences! Thank you so much, Gina! I hope you have a wonderful Thanksgiving! What a great fall salad! This looks so good! Traci, you are so sweet. I’m so glad to have a great friend like you! I hope you have a wonderful Thanksgiving, and I can’t wait to see what you cook up! I’m with you and always crave a healthy salad during Thanksgiving too. The rest of the dishes can be so rich. 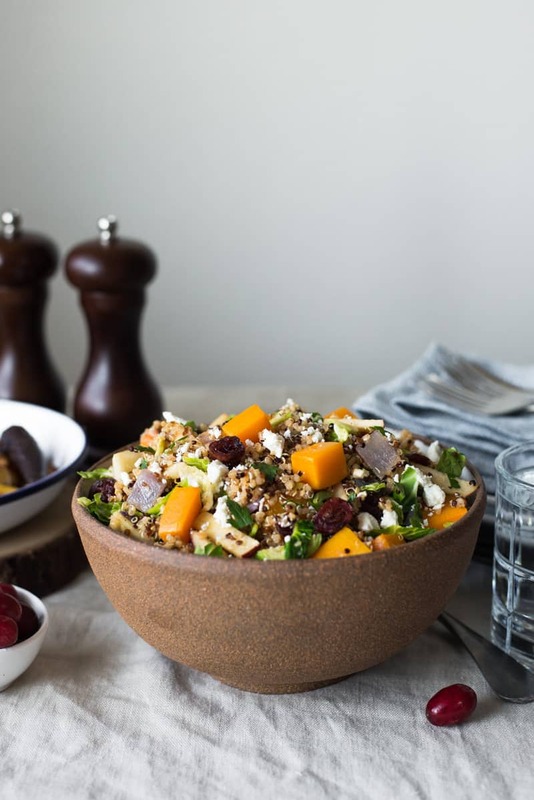 This is such a beautiful salad showcasing all that fall has to offer! This salad looks SO delicious! I am totally the same way – I just want a salad after all the heavy holiday food. Plus, I bet this salad makes beautiful leftovers when you just can’t bring yourself to eat more mashed potatoes. It sure does! I’ve been eating the test batches of this salad all week! I love the message of this post Lisa. Thank you for the inspiration to slow down, notice and appreciate. I love this recipe! Sounds amazing. I love how comforting and delicious this salad looks. I’m the type of Thanksgiving eater who is always demanding of at least 1 green (not smothered in anything just roasted!) vegetable on the table. While I will always love my carbs it’s just as important to get in some of those healthy delicious bites. You speak my language, Brandy! Thanks and have a wonderful Thanksgiving! WOW! What a salad. Perfect for the holidays. I feel you about self reflection. We all need to do better with taking our time and being thankful for all the things we take for granted every day. Thank you so much for stopping by, Aysegul! I love your blog, too! Thank you, Claudia! Hope you have a great Thanksgiving, too! I’m with you — thanksgiving food can get heavy and overwhelming real fast. Last year, after the meal, I actually raided my in-laws fridge and ate some pickles straight out of the jar because I needed something brighter and more acidic to cut through all the richness! Having a salad on the table is a great idea, and this sounds so yummy with the quinoa and brussels sprouts (two of my favorite things). If I’m not too stressed out making the pies and mashed potatoes this year, I might have to make this too! Hahaha, I LOVE it! Hope you have a wonderful Thanksgiving, Willow!